As we get into the third episode of Kidding, we start to see Jeff Pickles start to try to move forward with his life despite the many obstacles going on in his life. For starters, he has to return to the dating scene in spite of his ongoing commitment to reuniting with his wife Jill. Sure his optimism still shines through, but we�ll soon learn that optimism can sometimes be just a shield from the real world. This is the first episode in the show to not be directed by executive producer Michel Gondry but instead it�s Jake Schreier, who previously directed two episodes of the Carrey-produced Showtime series "I�m Dying up Here". When we first see Jeff in the episode, he�s on the set of his show with one of his unique puppets called Thump-Thump. But just like Mola Ram in Indiana Jones and the Temple of Doom, he simply rips it out of his chest and examine it like he�s trying to teach kids how to improve your health the right way. Seb then shows his son the many fan mail they keep receiving from young women along with scandalizing photos attached to them. He believes that it�s an opportunity for Jeff to find someone to hook up with. 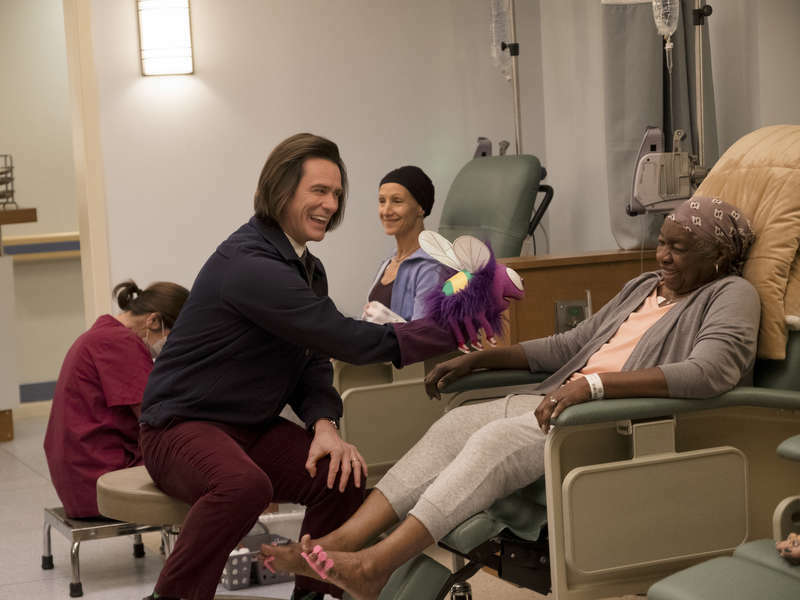 During a hospital visit for pedicure day, Jeff tries to impress a young woman named Vivian (Ginger Gonzaga who played Maggie on I�m Dying up Here) suffering from cancer. She lets him know that her doctor is busy with another doctor in the supplies closet, which peaked his interest. Back at his apartment, Jeff gives his visiting son Will a new magic kit as a way to stay away from his new friends and some drugs he�s been using. He even reminds his son the time they went to California for Nancy Reagan�s funeral plus the former first lady�s �Just Say No� campaign. However, Will throws away the kit in favor of hanging out with his friends for some pranks. Meanwhile, Jeff sets himself up on a date by responding to one of his fan mail. Her name is Shaina (Riki Lindhome), who reveals she turned her life around because of his show. They had a good conversation on their date before he walks her back to her place without a kiss goodnight. Returning to his apartment, he finds the young woman from the first episode with the two bottles of bear duct taped to her hands as part of a drunken game passed out in the hallway. He brings her to his apartment, lets her sleep on his bed, and give her a cup of water. When she asks him if he�s tired of doing the right thing, it triggered what he does next he never thought he would do. Meanwhile, Deirdre is dealing with her daughter�s growing condition of screaming at random times while throwing her hands up in the air. Though it could be because of a recent traumatic event, Seb believes all Maddy needs is a hug from her mother. As they cook some pie, Deirdre and Seb discuss some possibilities to save the show from Jeff�s growing insanity. Seb�s idea is to replace Jeff with an animated version of the host with an impersonator voicing the character. Naturally, Deirdre rejects the idea that may break his heart. The highlight of the episode is the scene where Shaina is rebuilding her life while Jeff�s Spark of Greatness speech plays over the scene. The speech itself sounds like something Jim would say in real life whether on a kids show or for an audience of college graduates. While a certainly a great speech in its own right, it shows what Jeff was like before the tragedy as the brightest part of humanity who can inspire even the oldest of ages. Some may find the very last scene of the episode surprising and shocking because of its content. It may seem like a stark contrast for longtime Jim Carrey fans who grew up with his movies, but it shows the character�s sudden descent into his own unusual behavior that�s supposed to be a stark contrast from his television personality. Who knows how deeper he will go from there come the next episode.